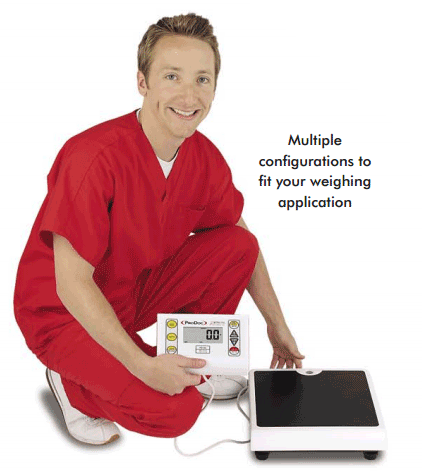 ProDoc Digital Physician Scales BUY Doctor Scales, Digital Scales, Professional Doctor Scales, Professional Physician Scales, Medical Scales, PD100, PD200, PD300, PD300MHR, PD300DHR, Detecto Scales. The PD100 ProDoc Scale, by Detecto, is a quality diagnostic tool made for daily use and abuse -- commonly found in clinics and health facilities to get accurate weight and body mass composition measurements with repeated use. It will also support heavier individuals where many traditional scales will not. 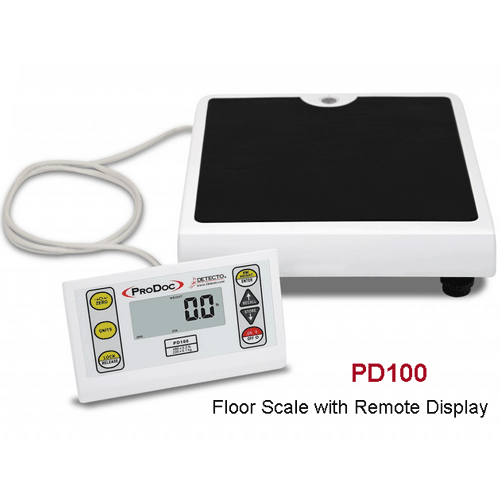 The PD100 is a 2 piece remote scale made with a heavy-duty base and can support body weight up to 480 pounds or 220 kilograms. It has four rubberized locking feet that can be height adjusted and will operate on any level floor surface. It has medical-grade accuracy and registers weight through its bold one-inch remote display. The display can wall mounted or set on a elevated surface like a desk with its included extra-long cable. The measurements are given to two-tenths of a pound increment. The remote display has several features that make storing weight measurements and determining BMI easy. With the intuitive button options, weights can be stored for later recall after the person weighed steps off the device. The weight measurement can be switched from pounds to kilograms. Those weight numbers can also be correlated to BMI percentage with the user punching in a height. The scale is powered by 6 AA batteries (not included) or an optional AC power cable (PD-AC). The PD100 is factory assembled and will work right out of the box. It measures both a person's weight and BMI percentage. The measurement is of medical-grade accuracy. The digital weight output is to two-tenths of a pound increment. Inputting the height to correlate with the weight, a BMI percentage can be displayed. The base is heavy duty and will hold people weighing up to 480 pounds. Weights can be stored for later retrieval. 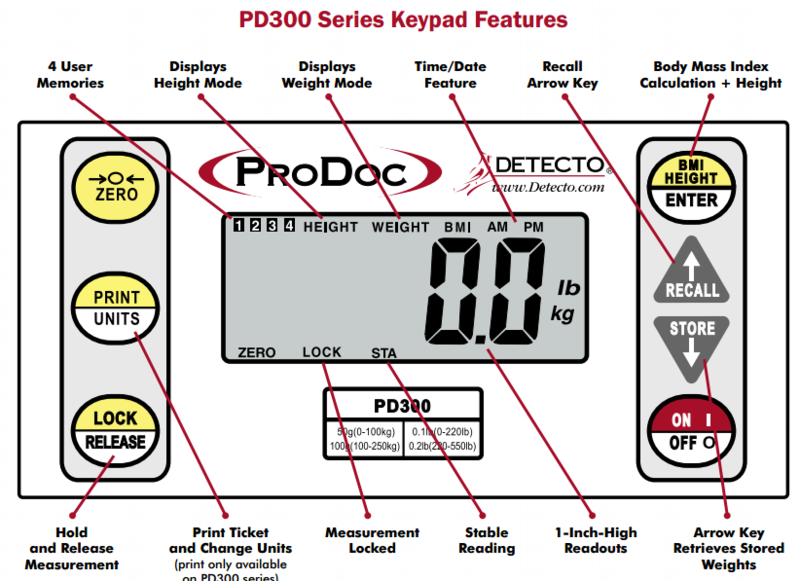 Detecto ProDoc Digital Professional Doctor Scales Owner Manual.